My love for charming Southern towns is never-ending, and today I’m sharing yet another one that's near the top of my list. This one is perfect for a mother/daughter trip, girls getaway, or a romantic couples escape. 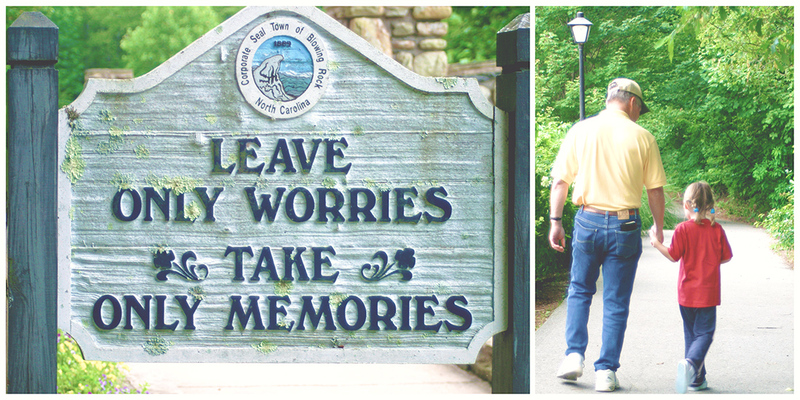 Here are a few of my favorite things to do in Blowing Rock NC. 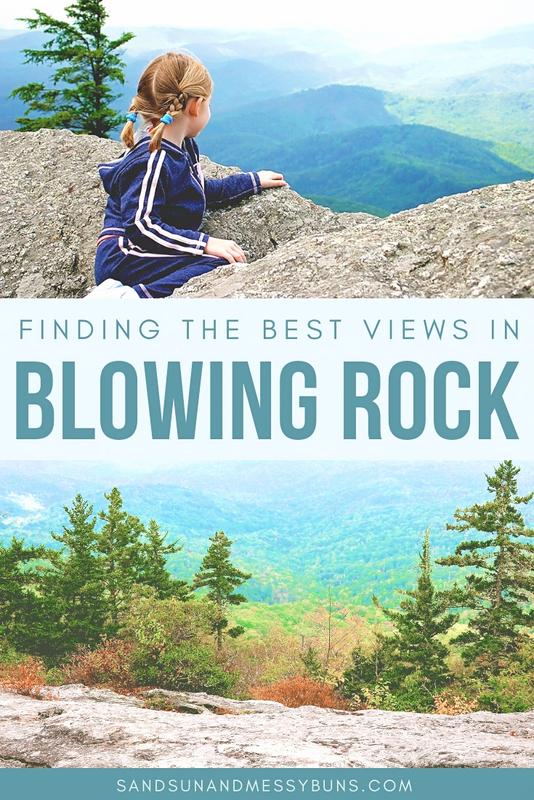 If you find my guide to Blowing Rock helpful, please share this image on Pinterest! 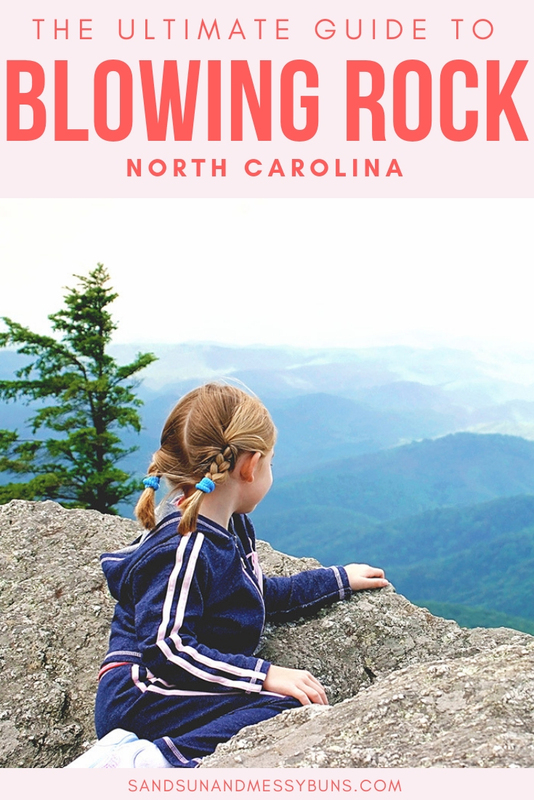 Blowing Rock is an adorable little mountain getaway town just 2 hours NW of Charlotte or an hour NE of Asheville. The name originates from a legendary wave-shaped rock with a mysterious updraft and unique story behind it. 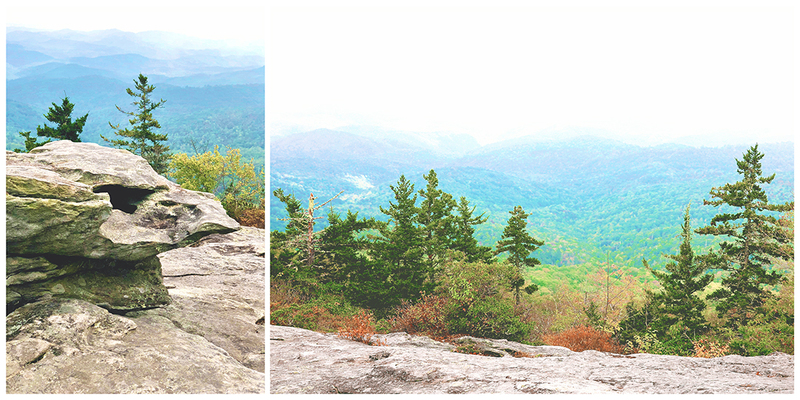 One of my favorite area attractions is the actual Blowing Rock — mainly due to its incredible views! They're breathtaking year-round, but when the leaves start changing colors in the fall…oh my. Let's just say I can see why homes in the area sell for millions of dollars! 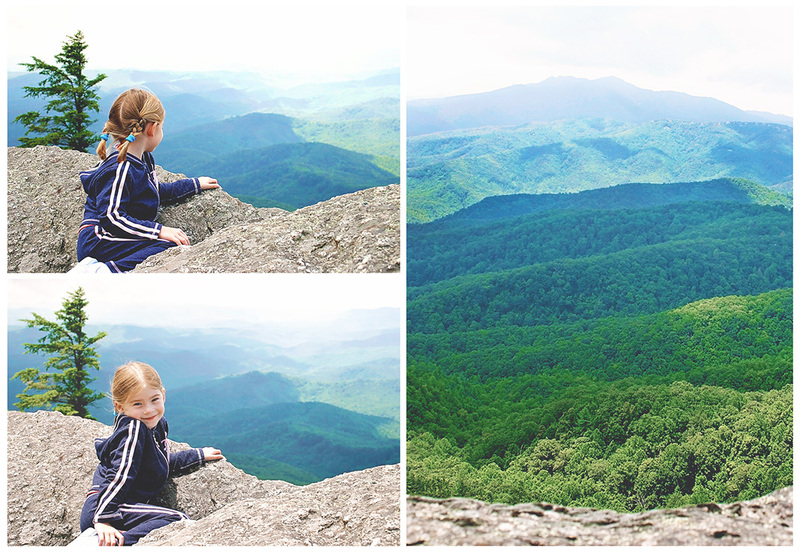 The Blowing Rock is a unique rock formation shaped like a wave that juts out over the Blue Ridge Mountains. The rock sits at an elevation of 4000 feet above sea level and has an odd wind that continually blows upwards from the valley below. If you were to toss a leaf off the rock, it might float in midair or even return back to you! 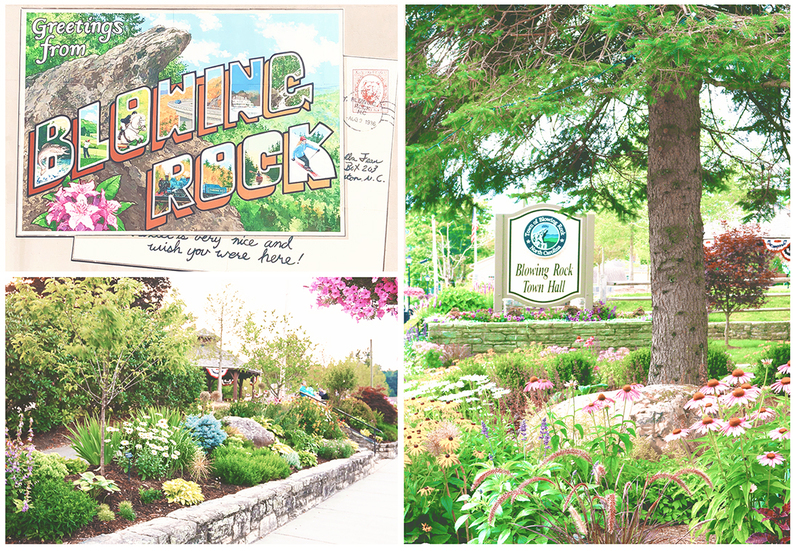 Hey, Erin…why is it called The Blowing Rock? Legend has it a Chickasaw Chieftain's daughter was shooting arrows off the rock when she nearly hit a young man from the Cherokee tribe. The two soon fell in love and became inseparable. One day the sky turned red, and — fearing something bad was headed their way — the boy leapt off the rock and disappeared into the woods to investigate. 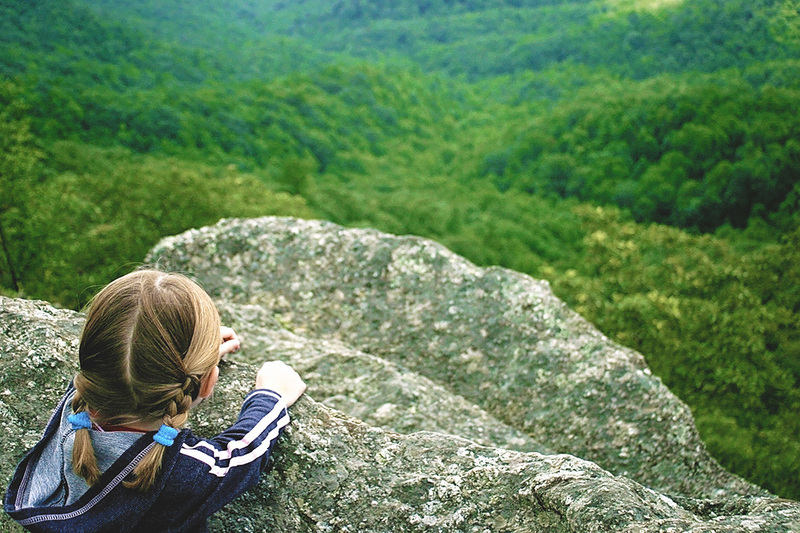 The young girl prayed daily for his return, until one day the sky again turned red and a strong gust of wind blew him back onto the rock from the valley far below. And that's how the rock got its name! If you can't tell from my photos above, the valley is 3000 feet below. It would take a VERY strong gust of wind to blow a person up to the Blowing Rock. The minimal entry fee provides access to the rock, an observation deck, and a pretty walking trail. The trail has some pretty views and it takes less than 30 minutes to complete, so I highly suggest doing it. Allot about an hour for the entire attraction. TRAVEL TIP: Be sure to call ahead to make sure it's open. Winter hours are weekends only, and they often close if the weather is hazardous. 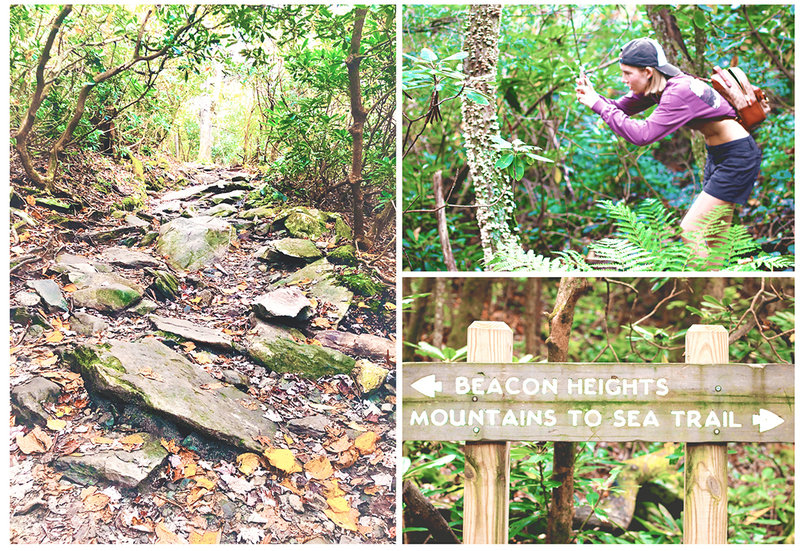 The Beacon Heights trail is located 12 miles (15 to 20 minutes) outside of Blowing Rock, but it's situated along the Linn Cove Viaduct– which has some of the most beautiful views in the area! It's absolutely worth the drive. Once you park, you'll cross a small road and then head off on the path into the woods directly across from the parking lot. From there, follow the signs to Beacon Heights. (Everything is clearly marked.) You'll make a right at the first sign, and then take a left at the second. The trail is a short .8-mile hike round-trip, but it's steep enough to get your heart pumping a little. You'll spot plenty of moss-covered trees, lichens, and colorful mushrooms on your way to the peak. Be on the lookout for roots and stumps while you're walking, but otherwise you can focus on enjoying the pretty scenery. That view from the top is pretty jaw-dropping! Sometimes you can see all the way to Charlotte from the Blue Ridge Mountains. The payoff is at the top, where there are two different areas with flat rock platforms and views for miles and miles. Either one makes the perfect spot for a picnic! If you want to capture sweeping views of fall color during October, Beacon Heights is the place to be. 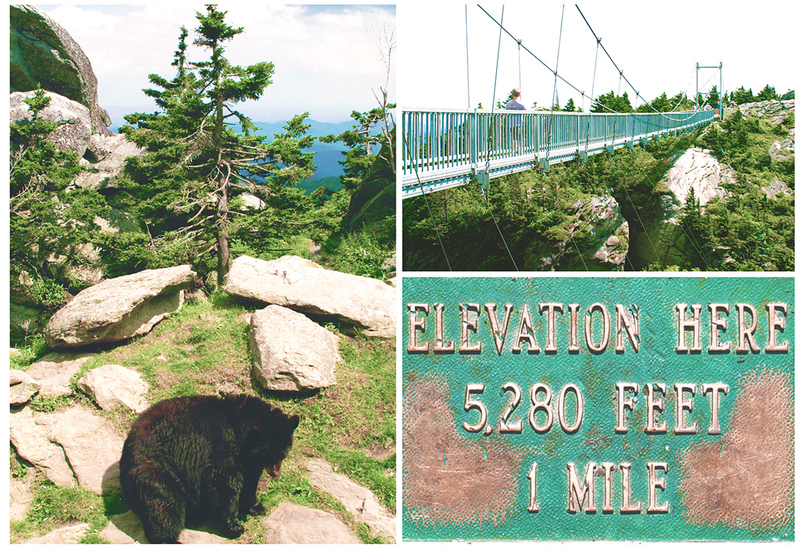 While you're in the Blue Ridge Parkway area, you might want to stop by Grandfather Mountain to check out the highest and most rugged mountain on the East Coast! There's a 228-foot suspension bridge known as the “Mile-High Swinging Bridge” that you can walk across — if you're not scared of heights! American black bears make their home in the Blue Ridge Mountains, and you can see them in their natural habitat at the Grandfather Mountain wildlife habitat. There are also cougars, bald eagles, and other mountain creatures that have been rescued and rehabilitated and now make their home in the habitat. TRAVEL TIP: Call ahead: They're officially only closed 2 days of the year (Thanksgiving and Christmas), but sometimes hazardous weather conditions force a closure. The star attraction at Moses H. Cone Memorial Park is a beautiful 20-room mansion known as Flat Top Manor. It was built in 1901 and currently serves as a center for local crafters to showcase their works. The property has 25 miles of carriage trails for horseback riding and walking. My favorite thing to do is take a leisurely walk around one of the lakes and then relax on the rocking chairs on the front porch of the home. Y'all know I have to list my favorite sweets shop in every small town I visit! 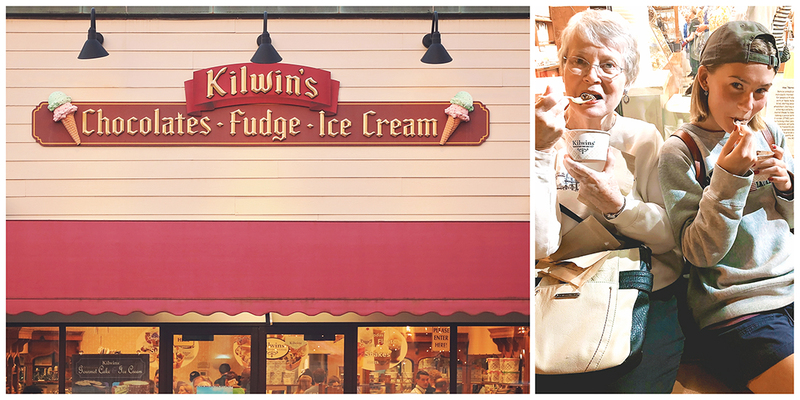 I love sampling homemade fudge, and Kilwins has some pretty exceptional options. The creamy chocolate ice cream earned both Mimi and Daisy's seal of approval! They're known for their Mackinac Island Fudge and their creamy chocolate ice cream. My personal favorites were the salted caramel and the classic chocolate fudge. 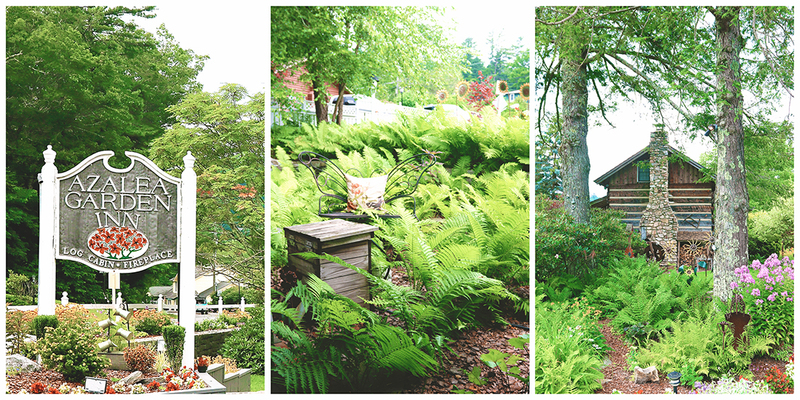 Blowing Rock is a town made for shopping! 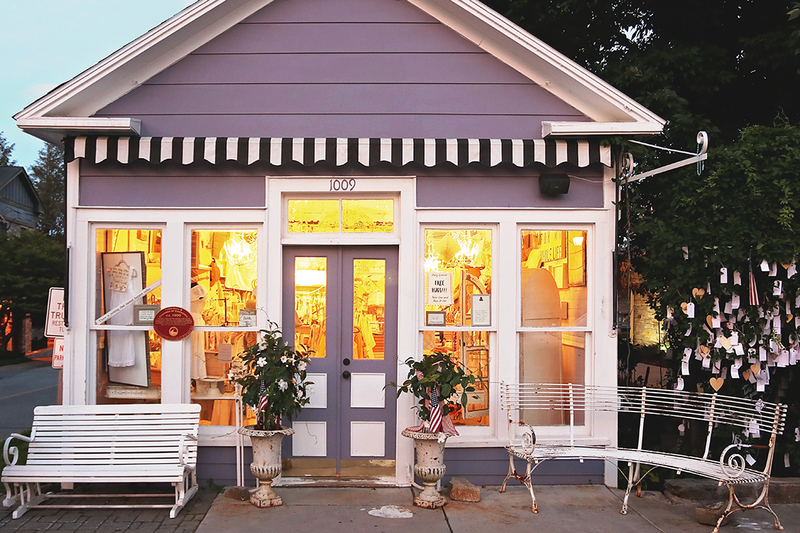 Whether you like boutique clothing stores, garden supplies, farmhouse decor, or upscale home decor…this little town has it all. There are lots of great little art shops, too. The stores are primarily located on Main Street and a couple side streets leading away from it. The shops are very walkable and are all contained within a few blocks radius. Many of the stores are in charming historical buildings, like the cute lavender Take Heart shop above. And yes, that's an actual wishing tree to the right of the store! How cute is that?! Make sure you stop here first! Take Heart is my favorite store in Blowing Rock. It's an adorable little shop filled with cute gifts, accessories, outfits, books, and more. The wishing tree outside the store has taken on a life of its own and has become so weighed down with prayers and wishes that many of the branches touch the ground and have formed a little cave underneath. 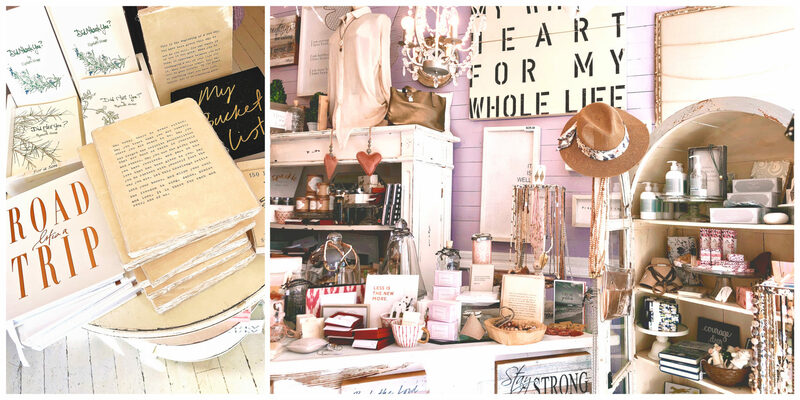 Take Heart is one of my favorite East Coast stores to shop for thoughtful gifts. The “Life is a Road Trip” journal is perfect for wanderlusters! 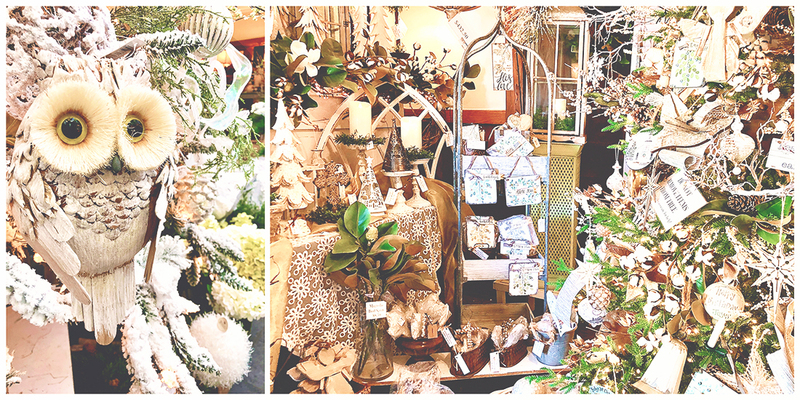 The Last Straw offers beautiful home decor pieces, plus lots of realistic faux greenery and gardening supplies. They have one small room of ladies outfits, but they're primarily known for their home and garden decor. The Last Straw is packed with home decor year-round, but it's particularly pretty during the Christmas season. I want that little owl for my tree! The Brass Exchange is where I purchase the majority of my faux greenery, stone planters, and farmhouse decor gift items. They have GREAT prices! Neaco is a gift shop filled with fun souvenirs and home decor. You'll find lots of items here for the kitchen and bar, as well as unique dinner party games and all the necessities for hosting a very entertaining party. You probably know by now that I always suggest shopping local when visiting a small town, but for those seeking the national retail chains, you can always head to the Tanger Outlets on the north end of Blowing Rock. From the crafters at Moses Cone Manor to the small galleries on Main Street to the museums listed below, there's no shortage of art (or artists!) to be found in the area. The 1888 Museum is tiny, but it's chock full of interesting photos! 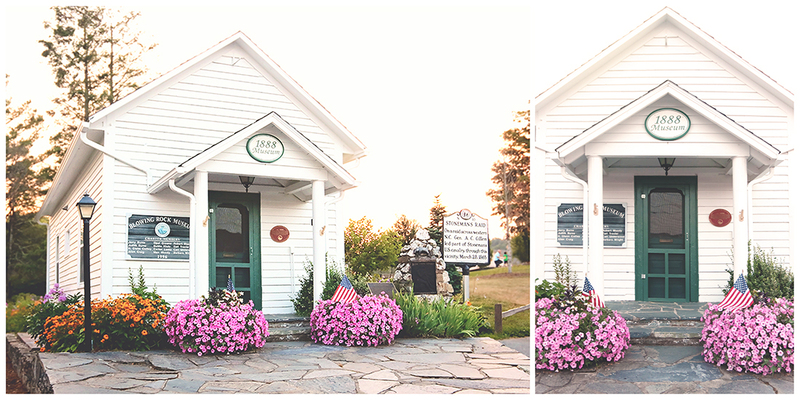 Stop in this tiny little museum to see a photographic history of Main Street. 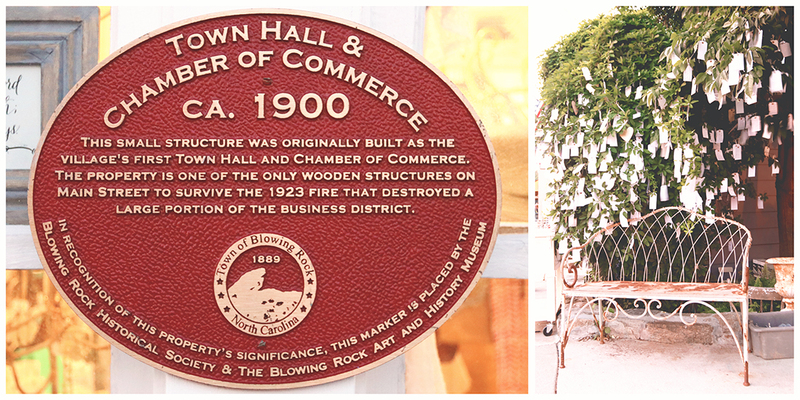 The Blowing Rock Historical Society aims to show how Main Street has evolved — and continues to evolve — through time, so they add photos to show improvements made to the area every 5 years or so. This is where you'll find rotating art exhibits, classes, and permanent collections that showcase the heritage of the Southern Appalachian region. Take a 3-D tour online. For 10 weeks during the summertime, visitors are able to meet and chat with local artists as they work. I love programs like this! We have them in Savannah, too, and it's a really unique way to learn what inspires an artist and to see how they go about creating their masterpieces. Edgewood Cottage was the first home of Elliott Dangerfield, whose works are displayed in The Met, The National Gallery, and in many private collections. 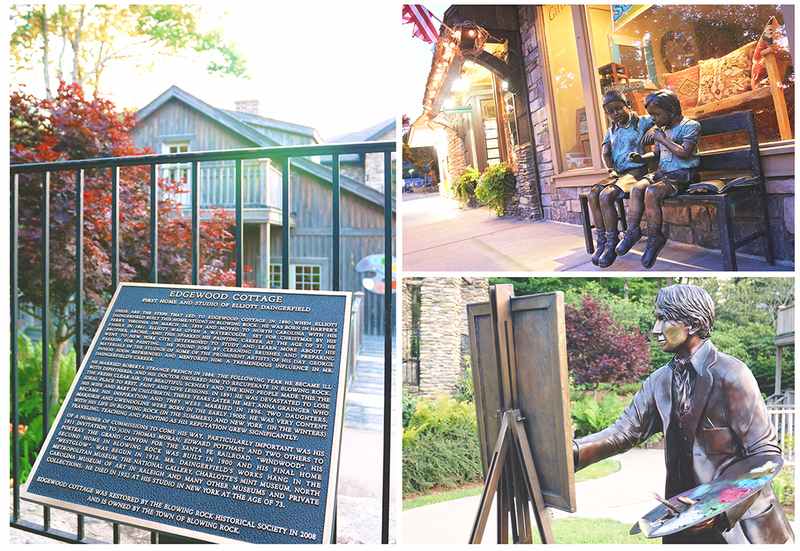 The bronze statue of the boys on the bench can be found on Main Street, while the artist at work is located in the grass outside BRAHM and the Edgewood Cottage. If you like hand-blown glass or pottery, you'll find lots of custom pieces in the galleries throughout town. Also, Asheville is only an hour and a half away, and it's worth the drive if you want to spend a day checking out the funky art scene there. 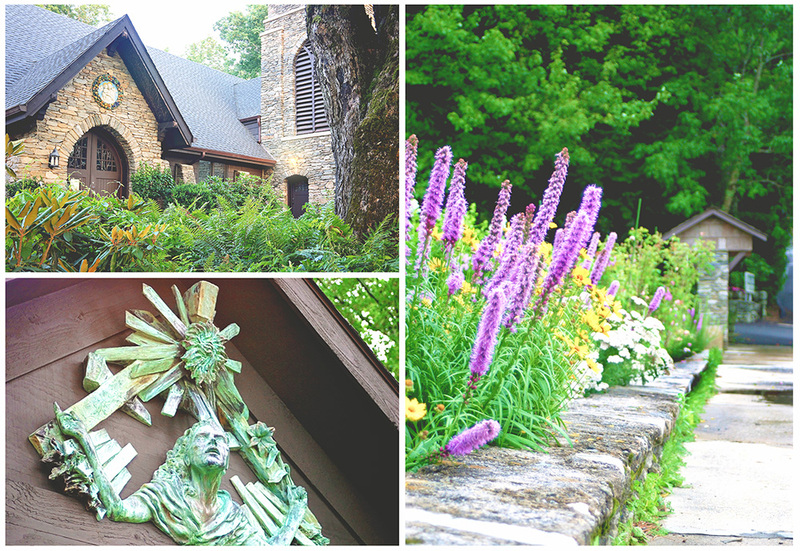 Is it weird that I think of churches as one of the must-see attractions in Blowing Rock? Maybe. However, they're really pretty, and they're located right on the main street that cuts through town. Make sure to peep at them as you're strolling by. St. Mary of the Hills Episcopal Church has so many incredibly beautiful details! I'm so sad to report that the beautiful (and gigantic!) 150-year-old maple by the front door was a recent casualty of Hurricane Florence. 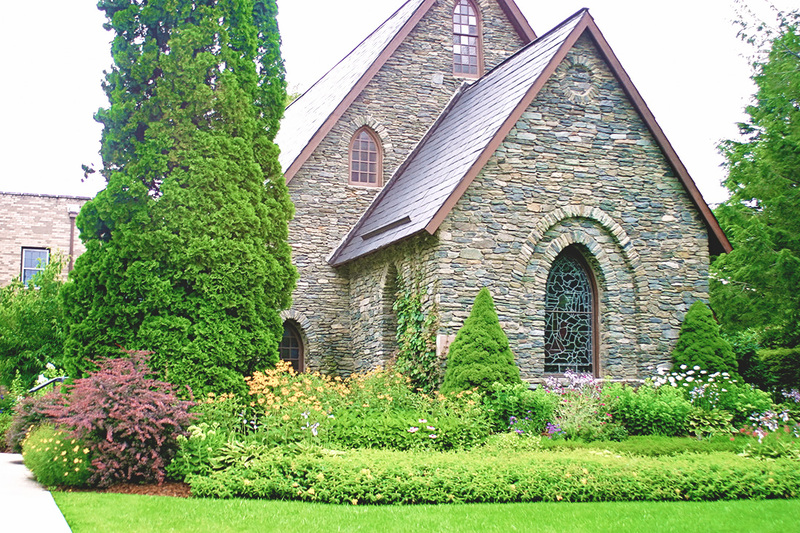 The churches always have beautiful landscaping, and I've even spotted bunnies hopping around in the grass! There's an incredible story behind the Number 12 locomotive, which was built for the East Tennessee & Western North Carolina Railroad (ET&WNC) and was once owned by none other than the famous singing cowboy, Gene Autry. You can learn all about the history of the railroad during your visit, and then take a 3-mile train ride through the Blue Ridge Mountains. The park is an incredibly well-managed local attraction and is fun for all ages! My goal is to make it there to have a Tweetsie Christmas this year, since I'm basically just a big kid at heart. This is such a fun activity for families! Choose from a small, medium, or “the mother lode” large-sized bucket. They’ll hand you one full of dirt that you can sift through in their water trough to reveal the treasures hidden within. You never know what you’ll find, and that's why it's so fun! From micah and quartz, to amethyst and emeralds, it’s always exciting to uncover a handful of gems. You're able to keep all of the gemstones you find, and you can also pay extra to have them polish your stones then set them in a piece of jewelry. It's kind of neat to take home a bracelet or a pair of earrings you “discovered” yourself! It's always fun to pick one quirky tourist attraction to try out when you're in a new area, and I suggest Mystery Hill when you're in Blowing Rock. It's a “gravitational anomaly” that causes water to flow uphill and people to defy gravity. You just need to experience it for yourself! TIP: Purchase a combo ticket to save a bit of cash if you're headed to both Doc's and Mystery Hill. Park on Main Street, then look for The Village Cafe sign. You'll stroll down a beautiful meandering path until you stumble upon the restaurant tucked away in a hidden garden. 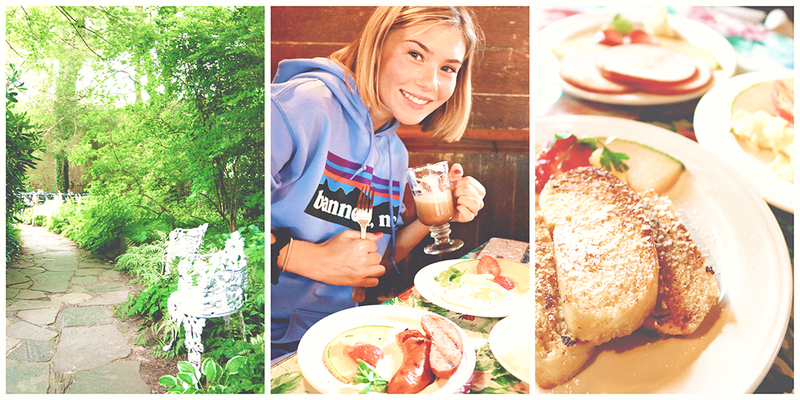 Try their Eggs Benedict or the French Toast made on their incredible Fugasa bread. Shoutout to my neighbors, Mr. & Mrs. Farmer, for introducing me to it! Meander down the winding passageway until you spot the charming historic old home that currently houses The Village Café…then load up on a hearty breakfast! Be prepared for a bit of a wait if you head out to Foggy Rock; it's a total hot spot! There's something on the menu to satisfy everyone, no matter how picky the eater. The seafood is fantastic, but so is the Italian (they have an all-you-can-eat spaghetti night for $8.50). There are vegetarian and gluten-free options, as well. This is a good option for families with kids since it has outdoor seating. The food is fresh, and there are plenty of American-style options to suit everyone. Bistro Roca is a nice little spot off the main road that serves up flavorful pizza and seafood options. The restaurant is popular with locals and is known for its lobster mac n' cheese. The Antler Bar is open until midnight, so it's a nice place to wind down and relax. If you're up for a drive, there's a fantastic Italian bistro in Banner Elk called Sorrentos. The spaghetti and meatballs dish is hearty and delicious after a day spent hiking and it's nice to relax by their fire pit. The Banner Elk Cafe is nearby and is another of my favorites! Fall is ideal, although it's the touristy season so you'll find the highest prices then. Spring is also beautiful. Chetola is one of the most well-known places to stay and is a beautiful resort property. The hotel faces a pretty little pond, and you’ll spot lots of ducks and swans wandering around the property. Guests can gather around the fire pit in the evening to roast s'mores. The lodge is perfect for couples and families (I recommend splurging on a room with a lake view), while condo options are best for larger groups. Continental breakfast is included with every stay. I went to Chetola with my parents when Daisy was little, and we loved it! The owners are very gracious Southern hosts, and there's a great little patio area with running water and rocking chairs where guests can gather each morning to chat over complimentary coffee and muffins. There's also a nice gazebo area that makes a great spot for catching sunsets. Bonus: It's within easy walking distance to all the restaurants and shops in town! My personal favorite home rental is about 15 minutes outside of Blowing Rock. It's an artsy little cottage located on a mountainside in Banner Elk. The owners live in the main house on the property, and the cottage was once their studio space. It's filled with art supplies and is such a cozy spot! PS: The owners of The Cottage raise chickens, so each morning we were greeted by chickens on the front porch! It was too cute. I posted some pics on our Instagram stories. This cozy little basement level walkout is closer to Blowing Rock and is an inexpensive alternative if The Cottage is booked. Related: How to Rent a Vacation Home You'll Absolutely Love. Option 2: Head towards Charlotte to take the quick and easy route. Travel the (recently widened and now open) 4-lane U.S. Hwy 321 straight into the center of Blowing Rock. This is the typical route and is smooth sailing for those who just want to get there. This is how I went during my most recent trip. Both the N.C. and S.C. Visitor Centers are much nicer places to stop along your route than the typical rest stops you usually find along the highway. Free parking is plentiful on Main Street and the side streets. Make note of the time you park, because there's a 3-hour time limit in the downtown area. They have “parking police” who walk by and mark your back tire with chalk every hour. Three strikes and you get a ticket! If you aren't able to find a spot on the street, there's a convenient parking area with two levels on Wallingford Road behind Blowing Rock Memorial Park. Who wouldn't want to visit a town with that as the official motto? I hope this post was helpful! If you have questions about any other things to do Blowing Rock, just let me know. What's the one thing on the list that you're looking forward to doing or seeing most? Erin Clarkson is an award-winning photographer, Savannah-based blogger, and author of the Savannah First-Timer's Guide. She spends her days exploring the Lowcountry and writing about its unique beauty. A true Southerner, she'll stop to chat with anyone, and that gift of gab has led to many off-the-beaten-path discoveries. Learn more and connect on Pinterest. 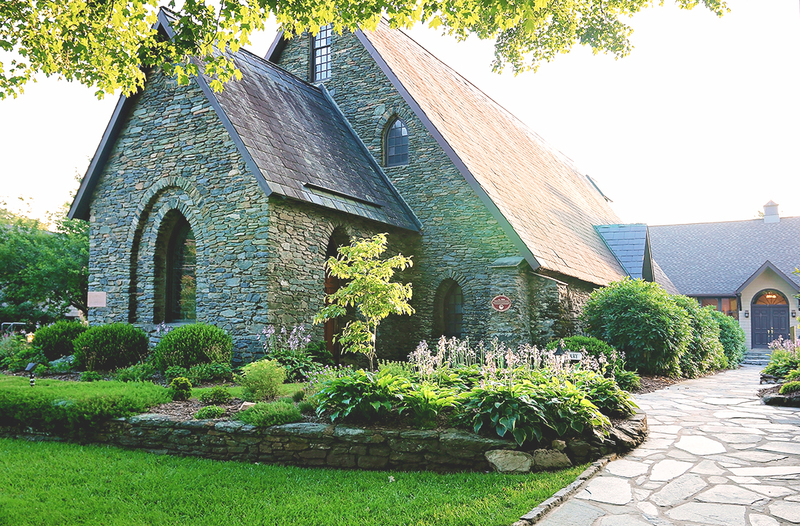 You didn’t mention two of my favorites in the area – Valle Crucis Park and Grandfather Vinyard. Even though it is a winery it is very kid friendly. Kids play in the creek with the vineyard dogs and mom and dad can have a glass of wine. They usually have music too. Valle Crucis Park has a little of everything. Check these out on your next trip! I love Valle Crucis Park! It’s such a great spot! I thought about adding it to the list, but I also want to write a post about Banner Elk and Boone, so I thought I might save it for one of those posts (since this one was rather lengthy already). If I end up writing about those two towns, I’ll probably switch the info about Grandfather Mountain to the Banner Elk post…and I definitely need to include the park pics as well as all of my Mast General Store pics. I haven’t been to Grandfather Vineyard yet, so I will definitely add that to my itinerary for my next trip. Thanks for the great tip! What a lovely guide! Thanks for including the cafes: any place that serves French Toast is worth my attention for sure! 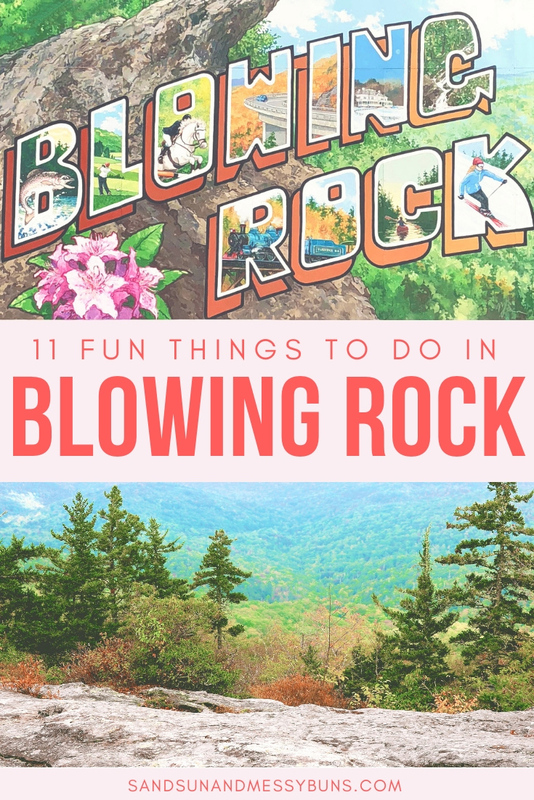 This looks amazing, I’ve never heard of the blowing rock before. I would love to visit one day, great pictures! Thanks, and yes, it’s super cute. Totally worth the trip! I was only able to go to Banner Elk once in the winter, so I didn’t get to go to Blowing Rock! I need to go there one of these days! Yet another place I need to add to my list! Sounds like you had a great time. We did! And one of these days I’ll convince you the U.S. should be closer to the top of your bucket list 🙂 It’s my goal.